Apparently, it's in Chicago. Called Exelon City Solar, it was completed last year, generates 14,000 megawatt-hours of electricity per year, and powers up to 1,500 homes. More interestingly for us, it sits atop a 41-acre brownfield. The Dirt sees it as part of an emerging trend. 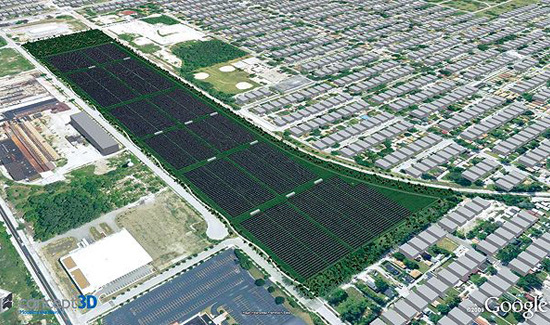 Instead of paying for a costly clean up of their heavily polluted sites, cities invest the money into solar farms. Might this escalate to the point that we see the Fukushima Exclusion Zone turned into the largest wind farm in the world? Sure the place is radioactive but at least there are no militant NIMBYs living there to protest against it. The worse the disaster gets, the larger the contamination site — which ironically translates to more clean energy. It's seems like a great idea to skirt NIMBYism with brownfields, but doesn't this leave environmental issues, like say groundwater or other ecological ripples, untreated? Seconding Daniela's second observation. Solar panels are not a layered/multiple benefit approach to environmental remediation.